What is laparoscopy - keyhole surgery? Laparoscopy or keyhole surgery is a procedure by which organs within a body cavity like inside the abdomen are visualized by inserting a telescope into the cavity through a very small incision. When connecting the telescope to a small video camera the images are transmitted to a video monitor. This image is magnified several times and obtained without physical strain on the patient or the wall of the body cavity. What is operative laparoscopy or endoscopic surgery? minimal organ and tissue handling. Laparoscopic surgery has been demonstrated to offer better cosmetic results as incisions are small and become invisible over a short period of time, less pain after surgery, much shorter hospital stay with discharge from hospital the same day or after 1 night. As for recovery, earlier resumption of normal activities and employment. It is not unusual for a manual worker to return to his work within 7 days after keyhole hernia operation or a professional football player to resume training within 7 days and return to a full competitive match within 3 weeks. Laparoscopic surgery carries the same risks as any other surgery with some unique differences. The treating surgeon would discuss those aspects with patient.
. recurrence rate of open hernia repair between 8 and 15%. - Injury to internal organs, bladder, blood vessels or bowel. - Anaesthesia for laparoscopic surgery. - All with general anaesthesia. - Risks associated with general anaesthesia, endotracheal intubation, drug reaction and cardiac and chest complications. - Bleeding from the entry site. - Blood transfusion may become necessary, but it is rare. 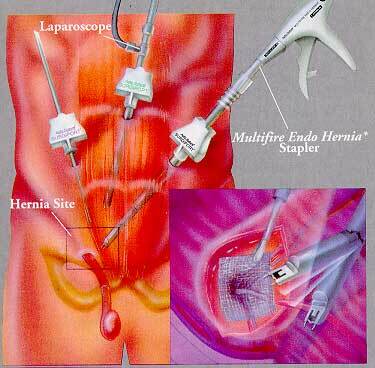 - Hernia recurrence in the case of laparoscopic repair of a hernia or incisional hernia through the small entry site. - Keloid and painful scar are rare. - Blood clots in leg veins, (deep vein thrombosis) and clots in the lungs are rare. Traditional Approach: This surgery is done from the outside through an incision in the area of the hernia. The incision goes through the skin, fat, and allows the surgeon to get to the level of the hernia. A laparoscope connected to a camera is inserted through a small hollow tube, allowing the surgeon to view the hernia and surrounding tissue on a video screen. 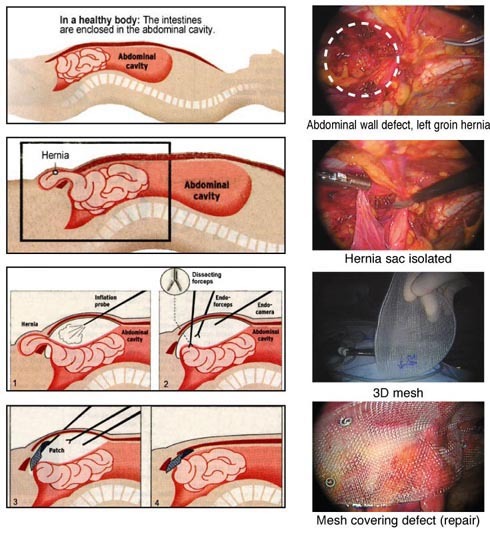 The hernia is repaired from behind the abdominal wall.